Great for your home or to give as a gift. 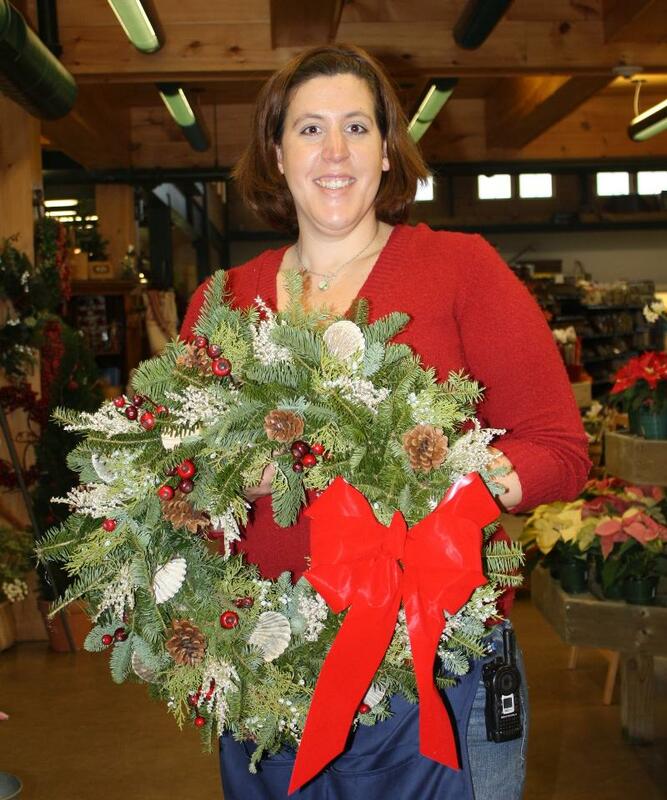 Liz Morcone de Souza, our wreath specialist. There's plenty of room in the Sunday class! Have Your Reservations for Friday Night Yet? 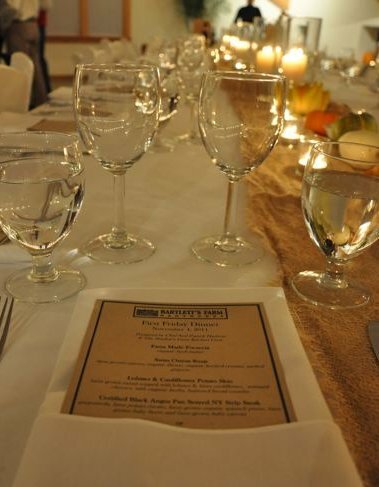 This First Friday Dinner is the last one until February! Tomato and Goat Cheese Soup, Fried Oysters, Veal or Organic Spinach Fettuccine and a trio of chocolate desserts. Thanks to the mild weather, we are still enjoying freshly harvested organic greens - mesclun, baby arugula and baby spinach - for a little while longer. Many of us are gearing up for holiday baking - and we have what you need. King Arthur brand flour is what we use in our kitchen, and that's what we have on the shelves for you. Bags are from 2-10 lbs. Chocolate chips, baking chocolate, spices, and sugar are stocked up and ready for you to use when you make your grandmother's famous chocolate cookies! Having trouble choosing gifts? Look in the market for signs that say "Great Gift!" Kate has picked out some wonderful choices for you! Need some gift ideas? Bartlett's Farm Gift Cards are always appreciated. And for the cook? How about our new farm cookbook? It's full of gorgeous photography and 75 mouthwatering recipes for every season of the year. We are offering pre-made gift baskets this year, too! They are all wrapped and ready to give and are in the market. If you own a small business, these baskets might be perfect for employee gifts! And if you have relatives in far-away places, we will custom decorate and ship a Nantucket-style wreath for you. In order to guarantee timely shipping, the deadline for shipping wreaths is Monday, December 12. We have plenty of decorations for the whole holiday season. 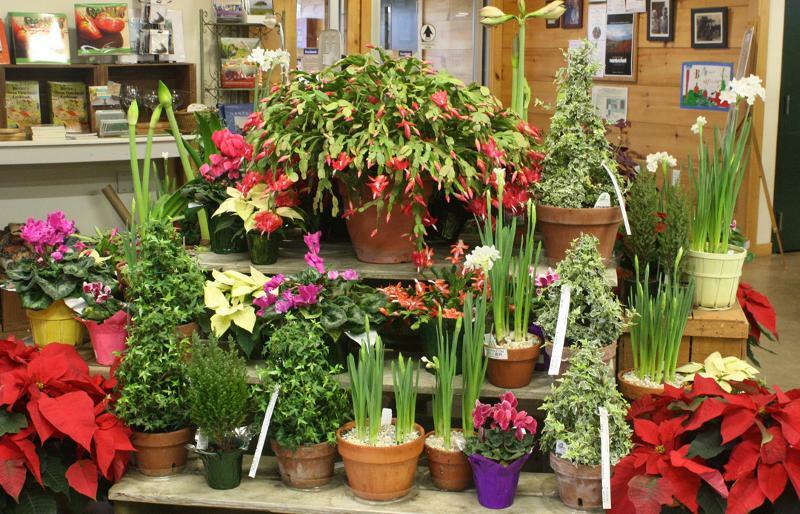 From trees and custom decorated wreaths, to poinsettias and amaryllis! We're open until 6pm, so you can some out and shop for your live or cut Christmas tree after work! Our helpful staff will help you choose your tree, cut the trunk and tie it on to your car! 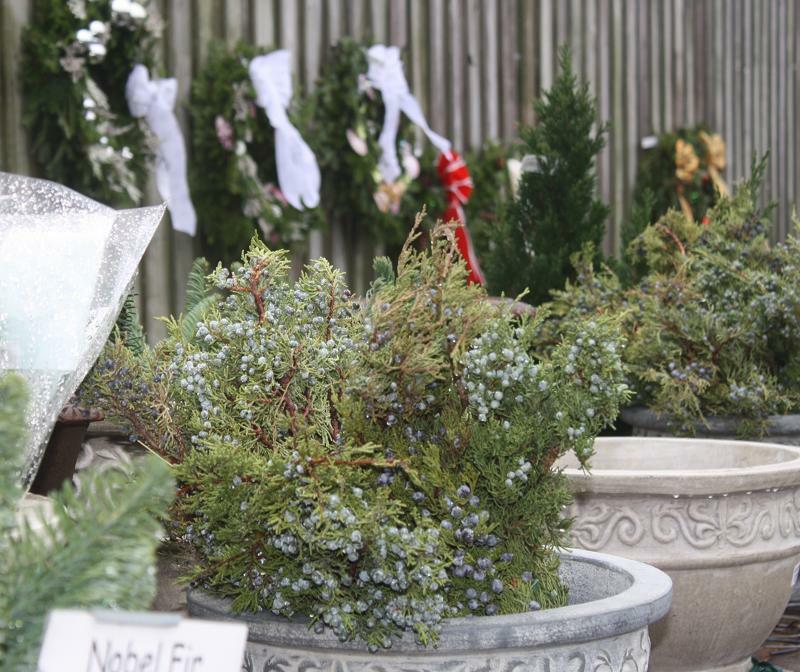 Wreaths, greens, trees, poinsettias and other holiday plants are all in the market! NEW FOR STROLL THIS YEAR! Enjoy a bit more of our island by grabbing the Stroll Shuttle! Offered from 1:30 p.m. until 6 p.m. and taking off from in front of the Whaling Museum, these shuttles will make a loop around the island, stopping at various locations offering activities for adults and children. Feel free to get off at any stop, enjoy the activity and catch the next shuttle that comes around! Look for the Costumed Santa's Helpers who will help you into our decorated vans! Vans depart every 20 minutes or when full, with stops at Cisco Brewers, Bartlett's Farm and eight other businesses. 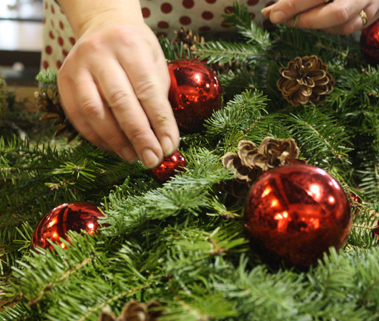 We will be sampling food and having wreath decorating demonstrations all afternoon. We Have the Rock Paper, You Provide the Scissors! Every once in a while, a product really catches our eye for all of its 'green' qualities. Rock Paper is wrapping paper that is100% tree free, 100% chlorine free, and is made from pulverized limestone and a small amount of non-toxic resin as a binder. There is zero water consumption in the manufacturing process, plus there's no hazardous waste. It's waterproof, tear-resistant, and pretty! Made by Earth Balance Bag Company this wrapping paper is perfect for the environmentally conscientious consumer. 100% Recyclable...just throw it in with your plastics! December 17: 10 AM Drop-n-Shop! Parents!!! Take advantage of a little supervised time for your children while you do some shopping. Kids will watch the original 'Grinch' and have some snacks. This email was received by more than 4400 faithful farm enthusiasts!